Is it time for long-term care for your client? Currently, the clients you provide with senior care services can live relatively independently but may require your assistance with daily tasks such as grocery shopping, meal preparation and cleaning. However, if your client becomes sick or an illness progresses, you may start to witness changes in their behavior, mood and other aspects of their life. If these alterations begin to affect an individual's ability to live with your assistance, it might be time to talk with the family about the possibility of long-term care for their loved one. Issues with memory: If you realize that a client is experiencing memory problems more often than normal, it could be a sign that dementia or Alzheimer's is worsening or that he or she has another more serious medical condition. You may notice that he or she can't remember where the keys to the house are, what the plan for the day is or how to get home from the grocery store. Sleeping and eating changes: If your client goes from sleeping and eating well to experiencing insomnia or a loss of appetite, it could signal that he or she is experiencing health concerns such as dementia, a stroke or a heart condition. These changes needed to be monitored closely and more frequently to determine the cause. Other changes could include extreme fatigue all day long or eating more than normal. Lack of balance: Even if your clients haven't experienced issues with limited mobility, you may notice that they are less steady on their feet or falling down more often. 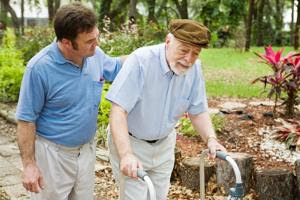 This could be a sign of deteriorating health, and long term care can provide extra assistance throughout the day and night.